Painting with Light delivered a show design for Belgian superstar rockers Clouseau for their ‘Clouseau Danst’ tour concept, staged over four sold-out nights in December and January at the 20,000 capacity Antwerps Sportpaleis. Utilizing new audio-linked software from Notch and several other fresh ideas to keep the visuals pumping at the same pace as the band, the show-stopping performance delivered 34 stomping Clouseau hits and favourites, old and new, with impressive style. Painting with Light’s team was led by Luc Peumans, with lighting programmer and operator Paco Mispelters, head of video content Michael Al-Far, d3 programmer Jo Pauly and associate media programmer & video content coordinator Katleen Selleslagh. Clouseau wanted to create an atmosphere that would engulf and engage the entire room and everyone it. The band hired Ish Ait Hamou, one of the best known and most successful choreographers in Belgium, to assist in directing the show. For the first time, a Clouseau gig featured an 8-person dance troupe strutting their stuff during four songs and Koen and his brother, lead guitarist Kris, engaged in a dance battle in the second half, thrilling fans … all quite a radical departure from former shows. When the Painting with Light team received the proposed song running order, Luc and Michael sat down and mood-boarded the entire set, which was also the first time they had taken this approach for a large scale rock spectacular. They discussed at length how the lighting, video and flexible stage layout – with various elements automated by WIcreations – would work as one fluid ‘bigger picture’ over an epic three hour performance, together with the band and their choreography. Once the process was running, the move away from devising a linear technical narrative for the show was “an obvious and very satisfying collective way to work” says Luc. They also decided at this point to base the video playback content on graphic material which could be animated to create new and funky effects. To this end, Painting with Light also invested in new Notch software, a platform they had been considering for some time, initially to use as a grading tool for live camera feeds. As the show aesthetic evolved, the Painting with Light team and live camera director Hans Pannecoucke (although he allows us lazy English to use the slightly more pronounceable version of ‘Pancake’) decided that four sub-mixes (for the live cameras) would be sent into the primary d3 4x4pro media server from Hans’ PPU. As more was learned about Notch - and after attending a special training session in Germany - they decided to harness the power of its real-time rendering and audio-connectivity to define detailed layers of graphical content which could have movement and other effects triggered by multiple audio inputs. It created a succession of graphic special effects that flowed and grooved to the music, a rhythmic animation twist to an already vibrant and diverse array of video graphics. This was picked up live by the audience, effectively harmonising the whole room and creating those immersive feelings so fundamental to the concept and vibe of ‘Clouseau Danst’. Adding to the already strong connection between band and fans, 20,000 RGB wrist bands were distributed to the audience each night, which were DMX controlled and running through the lighting desk. The first time the wrist-bands were fired up, Koen waved his arms in the air and 20,000 wristbands followed, synchronised in a single magic moment! The video hardware and the way it was configured onstage was driven to some extent by the content and its role in the whole design ‘shaping’ process. All the LED screen products were 10 mm in pitch, and upstage at the back was a 30 metre wide by 10 metre high LED wall, rigged on tracks so it could be split in up to five sections and moved manually into different configurations. Hanging upstage in the roof were five triangular shaped pods, each featuring five trusses clad on three sides in LED and tapering to a triangle shape at the top. The LED panels used were specially developed for technical supplier PRG to make the joins invisible. Combined with the graphic material, they could either pop out in a real 3D effect or disappear and be absorbed as a backdrop to the stage action. These video pods all moved into different positions and angles on three WI moving hoists, further changing the architecture of the stage space. With the idea of motion already an established part of the visuality, having automation in the set was another way of connecting with the fans and keeping up the pace and action. Below on the floor was a set of band risers which mirrored the triangular shape and five layers of video from the pods above on their front fascias. The playback content, which appeared in all 34 songs of the ambitious 3 hour set, was stored and played back from Painting with Light’s own d3 4x4pro server with a 4x2 running the venue’s LED digital tickertape balcony border. Hans Pancake’s camera mix involved 10 cameras, four operated, three robo-cams and three lipstick cams clamped onto strategic bits of backline. From these feeds he sent the four sub-mixes to the d3 for outputting onto the LED wall and occasionally to the pod video surfaces. As the basic structural video and stage set design and the graphic content were evolving, Luc Peumans and Paco Mispelters started looking at lighting. Paco has been the LD and operator for the ongoing 2016 Clouseau Danst theatre tour which has played throughout Belgium and the Netherlands for most of the year. The basic idea was to mimic the same immersive style adopted during the tour for the video, having an intense, club-style epicentre that people can step in and out of as they wish … while the hub of the action keeps pumping with energy. A six piece brass section enriched and added extra groove to the Clouseau rock sound and musicians and singers onstage alike also needed to be well lit. Fifteen Clay Paky Mythos were rigged on each of the video pods, spaced to match the shape of the video strips, with 124 x Mythos in total on the rig, 20 on the deck and the others dotted around six trusses above the stage, there were plenty of options. When the upstage screen split into five sections, it revealed six vertical lighting ladders in the gaps, each with five of PRG’s proprietary Icon Beams and five single-cell Moles spaced along them. There were six upstage / downstage oriented moving lighting trusses in the roof between the video pods, which also flew in and out, each truss populated with four Mythos and three VL3500 Washes, plus two SGM Q-7 LED strobes, also used for floods and blinders. Luc and Paco both like the Chauvet STRIKE 4 LED blinders, so 24 were deployed across the rig, one on each of the five moving trusses and the balance on the overhead trusses for blasting into the audience, causing more mayhem! The staging elements were constructed by StageCo. 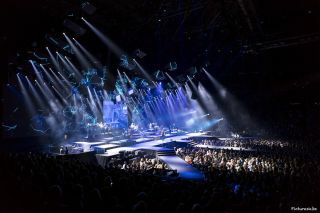 There was a long runway emanating from the front of the stage, used constantly by Koen to get right out into the audience and then a 15 metre moving bridge – from engineering specialist WIcreations - at the end of the catwalk which raised up and connected to the first ‘B-Stage’ area. Adding another WOW factor, a large rotating arm then lifted up out of the bridge ... with a platform on the end, so band members could jump onto it and journey out – just above the heads of the audience - to the two C and D stage platforms further down the arena. Above each of the B, C and D stages was a box truss containing an array of 4x4 Icon Beams creating a Svoboda-style grid of lights. Around the venue on the two balcony levels, 56 x GLP X4L LED washes were installed and clamped above each of these was a single cell DWE blinder, all to highlight the audience and ramp up the atmosphere and excitement. “It was very important to see everyone to create that all-encompassing club atmosphere,” says Luc. Eight follow spots were utilized, four Robert Juliat Cyranos on rotating truss chairs over-stage and four RJ Lancelots on the second level balcony and Paco ran the lightshow on a grandMA full size console, with a grandMA2 light for backup. Production manager Walter D’haese and lighting crew chief Filip Vanbroeckhoven, both from PRG, ensured that everything ran smoothly on site for the get-in, which commenced on Monday, allowing four days for rigging and rehearsals, with the first of the first two shows the following Friday. As the social channels buzzed with positive feedback about the overall gig experience, the mainstream press and media were equally astounded!